Increasing dominance of few players is projected to intensify competition in the global smart rings market. Leading players are using different strategies to strengthen their position in the market and to maintain an upper edge against their competitors. Innovation, collaboration, partnership, and expansion are some of the frequently used strategies. Moreover, increasing use of next generation near-field communication technologies by these players can further increase the competition among these players. In this report, researchers have thoroughly analyzed few leading players, which include Fujitsu, Logbar Inc., McLear Ltd., and Moodmetric. According to Transparency Market Research, the global smart rings market is projected to witness high growth by rising at 24.0% of CAGR over the forecast period between 2017 and 2025. Over this period, the market valuation is estimated to touch US$11.44 mn by 2025. In 2016, the market earned US$1.67 mn. Based on operating system, the android operating system segment is expected to lead the market over the estimated period. Significant rise in sales of smartphones is the key factor that led the demand for android operating systems. On the other hand, the demand for IoS operating system is also expected to rise at a faster rate over the projected period. Based on geography, Asia Pacific might hold dominant share in the global smart rings market. 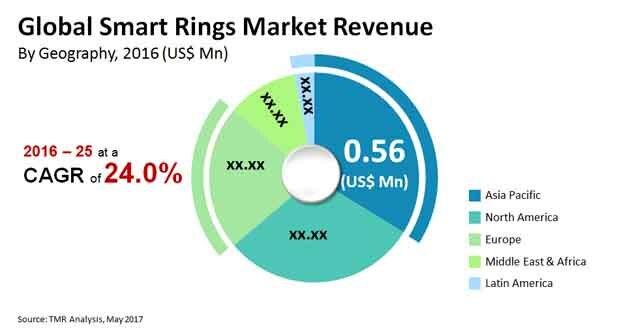 Dramatic rise in the use of consumer electronics such as tablets, wearable devices, and smart phones is the key factor for growth the growth of Asia Pacific smart rings market. Internet of things is playing a crucial role in developing the global smart rings market. In addition to that, increasing connectivity of smart rings with smartphones that helps in accessing messages, mails, notifications, and phone calls have further augmented demand in this market. Growing popularity of electronic wearable devices among young adults due to increased disposable income is likely to propel growth for smart rings. Moreover, smart rings are also widely used in storing pictures, videos, contact information, and other digital information. Another significant factor is the growing use of cloud-based services that helps in storing huge amount of data. From the health care point of view, use of smart rings helps in tracking pulse rates, heartbeats, and blood pressure levels, which helps in collecting health data with more precision. The collected health data benefits both the patient and the physician in providing advanced and well-analyzed treatment. Considering all the above-mentioned factors demand in the global smart rings market is expected to grow at a drastic rate. Inconvenience of charging smart rings with cables or dongles might refrain customers from buying smart rings. In addition, increasing dependency battery might deter demand in the global smart rings market. There are other challenges the market is facing, as it is currently in its primary phase of development. Therefore, players are not investing heavily in the market, which further restrict growth in this market. Despite these restraints, the global smart rings market might see in upward growth trajectory, due to the increasing demand for advanced technological wearable devices across the globe. The study presented here is based on a report by Transparency Market Research (TMR) titled “Smart Rings Market (Operating System - Android, IoS, and Microsoft Windows; Technology -Bluetooth-enabled and NFC-enabled Smart Rings; Applications - Mobile/Contactless Payments, User Authentication and Access Control, Information Sharing, and Monitoring Healthcare System) - Global Industry Analysis, Trend, Size, Share and Forecast 2017 - 2025”. Our reports are single-point solutions for businesses to grow, evolve, and mature. Our real-time data collection methods along with ability to track more than one million high growth niche products are aligned with your aims. The detailed and proprietary statistical models used by our analysts offer insights for making right decision in the shortest span of time. For organizations that require specific but comprehensive information, we offer customized solutions through adhoc reports. These requests are delivered with the perfect combination of right sense of fact-oriented problem solving methodologies and leveraging existing data repositories.